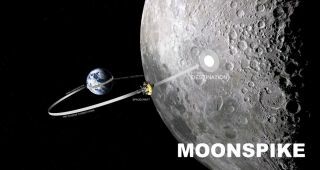 This Moonspike graphic depicts the private project's mission plan to launch a crowdfunded rocket and slam a titanium probe into the moon's surface. Moonspike's Kickstarter crowdfunding project launched on Oct. 1, 2015. While the rocket has yet to be built, and the launch site and date determined, the design is as flexible as possible for different latitudes of launch site, Larmour said. It calls for a 22-ton, two-stage, liquid-fueled launch vehicle that can get a spacecraft (a third stage) of about 331 lbs. (150 kilograms) to Earth orbit to send to the moon, Larmour said. Most of the work will be done in-house by a small team to contain costs, he added. "If we get backing we will move to a more detailed design as the next phase, and start building components fairly quickly," he said, but did not specify a date. As Moonspike is a young company, the founders chose Kickstarter because they felt that traditional angel investors (individual backers with deep pockets) or venture capitalists (companies that invest in startups) would not be interested in taking on the risk, Larmour said. The crowdfunding campaign will be "all or nothing," he acknowledged, with no Plan B if they don't raise the desired million. But if it does end up working out, the group plans to raise several tens of millions of dollars more through more traditional equity financing routes. The initial Kickstarter money will be used for hardware development and other setup to make investors more interested in the product, he added. This Moonspike graphic depicts the components of the rocket designed to launch the project's moon probe. A team of seven people are working directly on the project, with four other "experienced business people" on the board of directors, Larmour said. "The team we have gathered have both professional training with organizations like NASA and hands-on experience building rockets at Copenhagen Suborbitals, a private team of amateur rocket builders who designed and built several successful rockets on a shoestring budget during the past 7 years. The vehicles this team have designed and launched include the 9.3m tall [30.5 feet], liquid-fueled HEAT-1X, and the actively guided 5.3m Sapphire rocket," he wrote. An artist's illustration of the private Moonspike rocket launching on a crowdfunded mission to send a titanium probe to the moon. The Moonspike Kickstarter project launched on Oct. 1, 2015. As regulations are believed to be one of the key risks to mitigate, the group has already started discussions with the UK Space Agency to learn the ropes. The Moonspike Kickstarter campaign will run for 30 days. One of the perks offered to backers will be putting their personal images, videos or data on a "memory vault" inside the Moonspike payload. Outside of Kickstarter, a major sponsor will have the option of pressing the launch button.